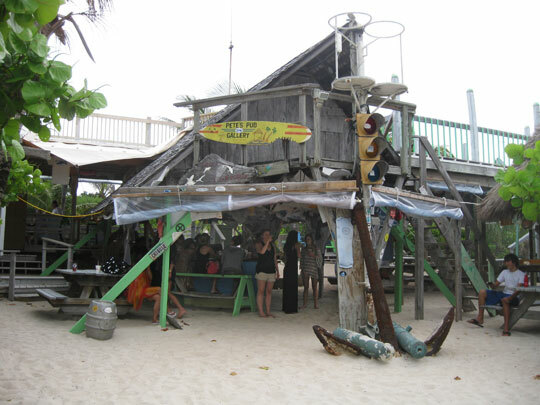 When I last mentioned Little Harbor it was described as our first haven in the Abacos. Basically it was a resting spot that was calmer than the Atlantic Ocean. We arrived, anchored mid-harbor in the Bight of Old Robinson, and were in sight of Little Harbor for three days as we moved around the bight to different anchorages. Imagine my surprise, when, a few weeks later Duwan said we should visit Little Harbor. She had been there before. So we anchored in the bight again after her six votes overrided our plan to go to Cherokee Point. Although it was Easter weekend we decided to dinghy in on the off chance that Pete’s Pub would sell us some ice. 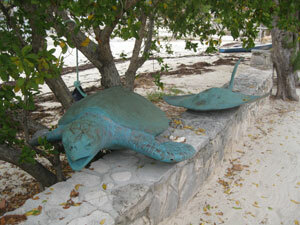 Turtle and Manta Ray sculptures outside the gallery. Little Harbor is surprisingly beautiful. I expected the Bahamas to be mostly flat sandy cays covered by casuarina trees (which we call Australian pines in Florida). But once again I was proven wrong. The approach to Little Harbor is guarded by a low stony outcrop on the left and a tall rocky cliff on the right. A few houses cling to the top of this cliff. What a view they must have of the Atlantic Ocean. Don’t spend too much time gawking, though, or you will run your dinghy aground in the shoals on the left as your humble narrator did. 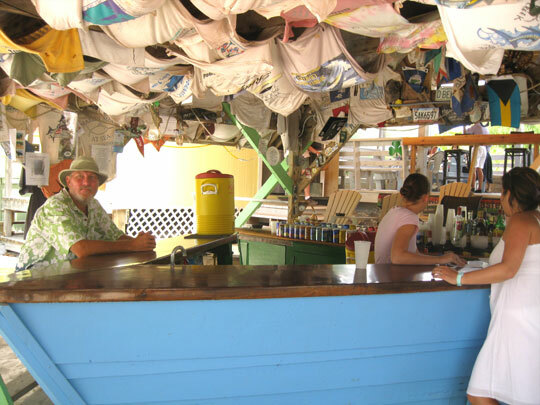 Proceed through the protected harbor wending your way through the boats hanging of mooring balls (actually tires) and make your way to Pete’s Pub. Pete is the son of visionary sailor and artist Randolph Johnston. This highly respected bronze sculptor established Little Harbor as his base, building a studio and gallery. The gallery displays a legacy of work dedicated to the Bahamas and to the human spirit. Pete carries on the tradition that Randolph established. Greg sits under a canopy of t-shirts inside Pete's Pub. We need to remember to autograph a Cabbagetown t-shirt and leave it next time. 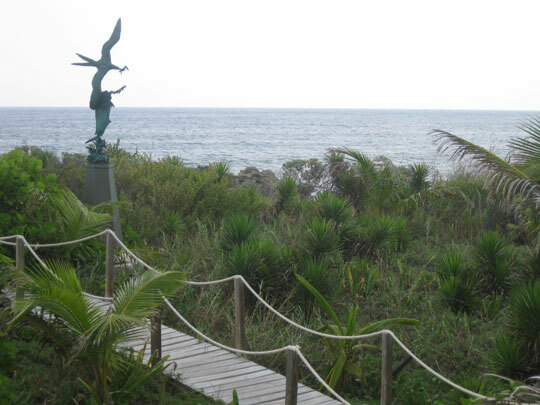 A view of the Atlantic with a bronze sculpture in the foreground. As we sat at the bar at Pete’s a few families came in and ordered lunch plates. After lounging around in the pub and visiting the gallery we went exploring. Many locations in the Bahamas sport spectacular view of the Atlantic. Added to the scenery here, though, are bronze sculptures. We went back to Pete’s to settle up and Duwan wandered off to take pictures. I noticed that the clientele had changed. Suddenly I felt very old. There must have been twenty buxom lasses in Pete’s laughing and calling each other names like Tiffany and Brittany. I paid and we left. On the way out we noticed a large orange power boat with Hooters painted on the side. 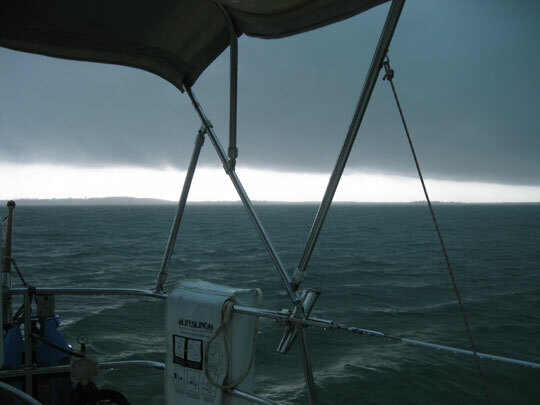 Back at the boat we saw that the forecasted storms were about to arrive. We moved to a better spot, anchoring just before the squall line hit. The view of the cloud bank that just went over us.